CSC Services can perform service condition surveys and culvert repairs. CSC Services have many years experience in providing culvert repairs to inlet and outlet cold water culverts during Power Station shutdowns or statutory outage periods. Works include inspections of the culverts by our experienced engineers to identify all defects which are then documented and listed for repair immediately, or observed for repair during future shutdown works (if the defects are deemed to have degraded further). Culvert repairs also include works to seal expansion or construction joints between the precast concrete sections of the culvert. These joints can open up through seismic movement, shrinkage or the sheer weight and volume of water moving through the culvert at speed combined with movement of materials surrounding the culvert. Culvert repairs to these joints are sealed with a combination of resin injection leak stopping and then a Sika combiflex over bandage or similar. The over bandage seals the joint preventing water ingress or egress while allowing the joint slight movement without leaking by forming a new expansion joint over the old. 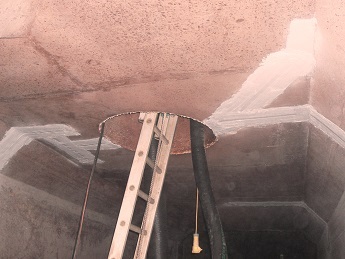 Culvert repairs also include patch repairs to localised spalled concrete and any coatings to walls, floors and soffits. These culvert repairs are completed using cementitious rapid set repair mortars which are suitable to match the strength of the original concrete in the culverts. Large culvert repairs can be completed using rapid set concrete spraying techniques or high build repair mortars of which CSC Services operatives have many years of experience. Our teams all have CSCS cards, EUSR Water cards, DOMS, Confined Space Certificates and are BSVR (Baseline Security Vetting Register) and CTC (counter terrorism check) vetted as a minimum. All operatives hold SSPC Train the Painter – Gold level accreditation which covers protective coating application, spray painting and abrasive blast cleaning. CSC Services are also members of the Concrete Repair Association. CSC Services recently performed a programme of culvert repair and associated work at Hartlepool and Dungeness Nuclear Power Stations for EDF Energy. A culvert repair at Hartlepool Power Station is shown.